Bats, Birds …. and Zebras? 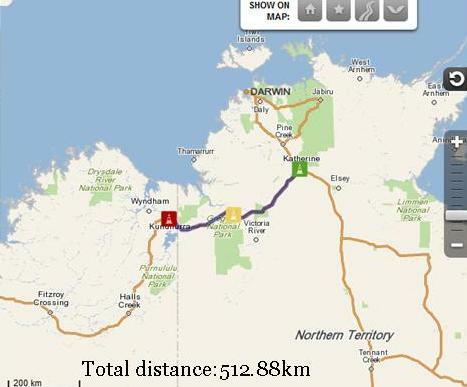 When I left Katherine I headed west towards Kununurra – Darwin, Litchfield and Kakadu will have to wait for another time. I keep telling myself “You can’t see everything” …. but …..I really want to! The problem is, the more you see the more you realize there is to see. How some people zip around the continent in a couple of months I’ll never know! They need to read my poem called ‘I Travel in the Slow Lane‘.…. My first stop on the way to the WA border was Timber Creek, where I finally caught up with Margaret. I surprised Margaret by turning up when I did as she had booked into the caravan park for the night so I went about 10kms out of town to Big Horse Creek, a great low cost camp ($3.30 a night) on the banks of the Victoria River. It was quiet and peaceful, not like Margaret’s night with screeching bats (flying foxes) around her camp. There were a couple of highlights of our stay at Big Horse Creek. The first one was when a Bowerbird displayed his bright pink comb for us – looks so out of place on such a dull coloured bird …. We have seen lots of these since around Daly Waters but these are the first that showed the pink on their necks. They are funny to watch as they are quite a big bird and they hop rather than walk. They were collecting the white pith out of the boab nuts to decorate their bowers with. Margaret also captured some great shots of some of the other birds in the area …. The second highlight of this stopover was catching up with Brian, whose farmhouse I had camped behind in Cudall, west of Orange NSW, about 18 months ago. He was heading east, I was heading west, and although he arrived late in the day and Margaret and I left early the following morning it was fun to fill in the gaps of the last 18 months. Our next camp was only a few kilometres shy of the Western Australia border at the Zebra Rock Mine. It was down a very dusty, corrugated road and then through a couple of farm gates to arrive at the camping ground. The Zebra Rock is amazing and is only found in this part of the world and the Zebra Rock Mine is the only operating mine. The age of Zebra Rock has been placed at 600 million years in the Upper Proterozoic era or Pre-Cambrian period. The only known deposits of Zebra Rock in the world have been found near Kununurra in the East Kimberley region of Western Australia. I had an extra night here while Sue, Margaret and Nev went off to Lake Argyle for a couple of days. 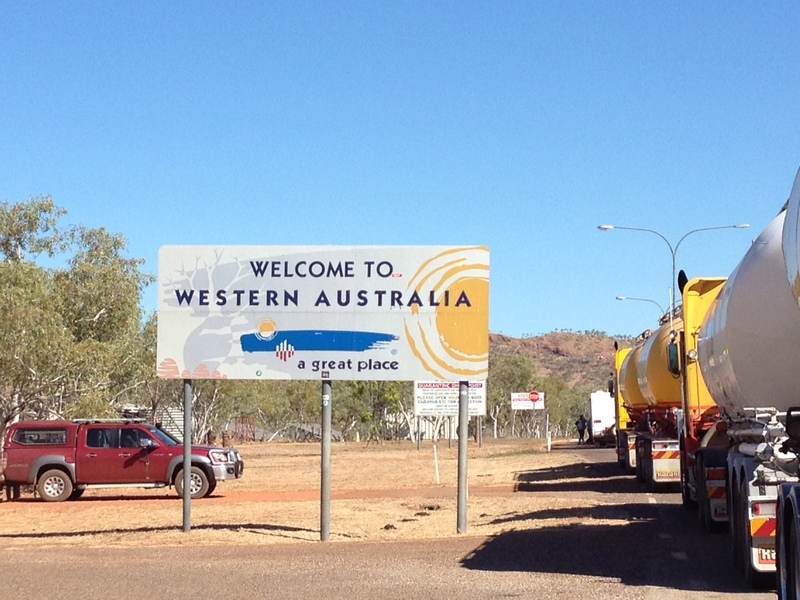 It was time to cook up all my vegetables and eat all my fruit so that I had nothing to declare at the quarantine stop when I crossed the border into Western Australia on my way to Kununurra. I feel like I’m home! Categories: Australia, Camping, Travelling | Tags: Australia, Big Horse Creek Campground, Bowerbirds, campervans and motorhomes, camping, Flying Foxes, Northern Territory, Timber Creek, Zebra Rock, Zebra Rock Mine | Permalink. Saunders Beach is north of Townsville, over the other side of the country from where you are. Here the beautiful Rainbow Bee-eaters sit on the overhead wires looking for flying insects. It’s a pity that the access to the Zebra Rocks is a corrugated road. I would have loved to go there 😥 I am glad you enjoyed it.